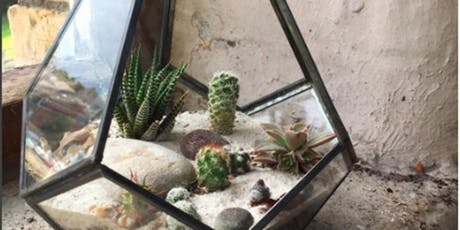 Join Ginny Scholey from Salvaged Gardens to create and take home a sophisticated slice of the desert as a beautiful cacti terrarium. 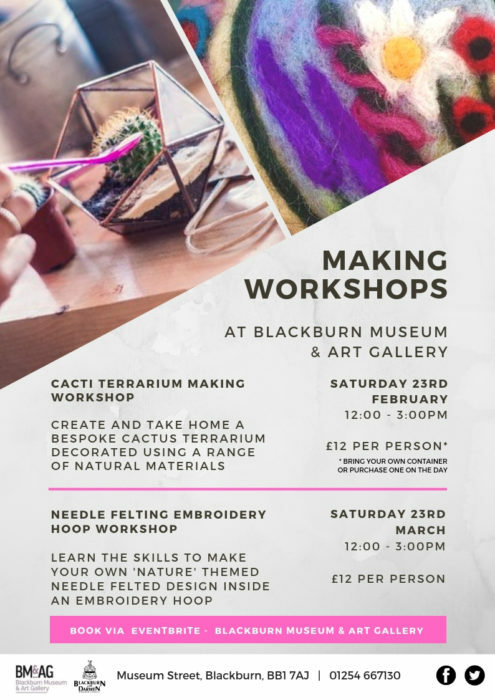 You will learn about cacti, their care and maintenance and how to design using a range of materials including natural and coloured sand, stones, shells, seed pods, moss and driftwood. You will leave with a beautiful bespoke terrarium. Bring your own container or purchase one on the day, with prices ranging from £8 up to £25. 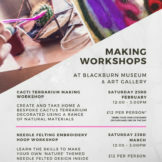 Book via Eventbrite, or in person at the Blackburn Museum & Art Gallery Reception. Ginny is a keen gardener and plant lover and has been for over 30 years. Having moved onto a boat and missing her garden, she became interested in the world of bottle gardens and plantscapes. Combining her own individual style, creativity and love of plants, Salvaged Gardens was born. Ginny’s aim is to bring living art into people’s lives, through terrariums, bottle gardens and workshops.